People give Criterion a lot of grief for including Michael Bay's Armageddon and The Rock, as it's a stretch to say that they fit the Collection's description as "a continuing series of important classic and contemporary film." Sure you can say that they are top examples of a specific genre (and The Rock is a genuinely enjoyable film), but any reasonable Criterion fan can accept their spine numbers as a way to help pay the bills that come with serving a very niche audience. 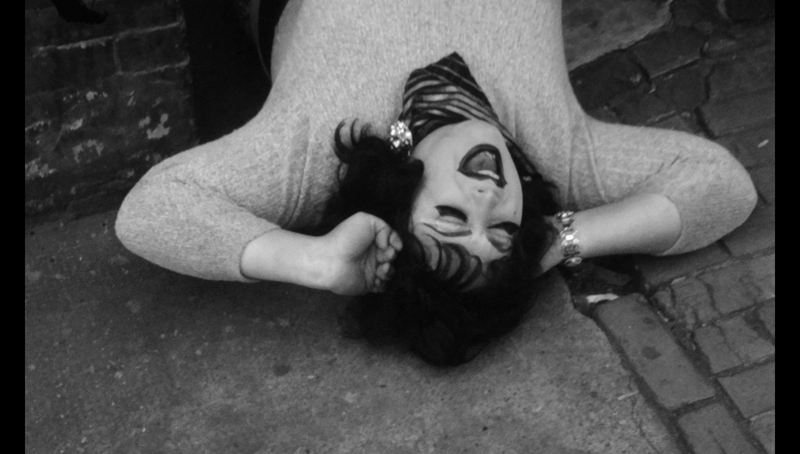 That niche audience is likely to welcome John Waters' Multiple Maniacs with open arms, but it could certainly be argued that, between Armageddon, The Rock and Waters' 1970 ode to outcasts, that the Divine vehicle comes in dead last. It's not particularly well-made (certainly not in Waters' top five films) and the acting and writing would often be considered sub-par for community theater. But here it is, getting a release as part of the Criterion Collection. If the reason why is that they couldn't license any other film by Waters but wanted him in the collection, then fine. That's a decent argument for including what passes for a half-decent college film. 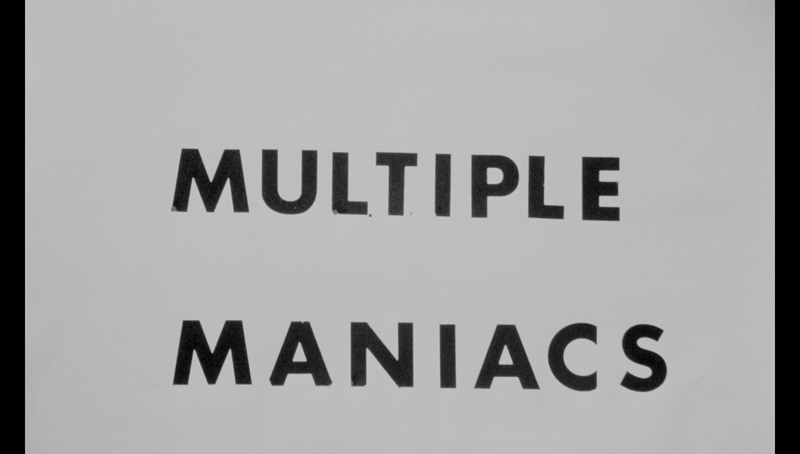 But to argue that Multiple Maniacs is Criterion-worthy on its own merits is a losing battle. 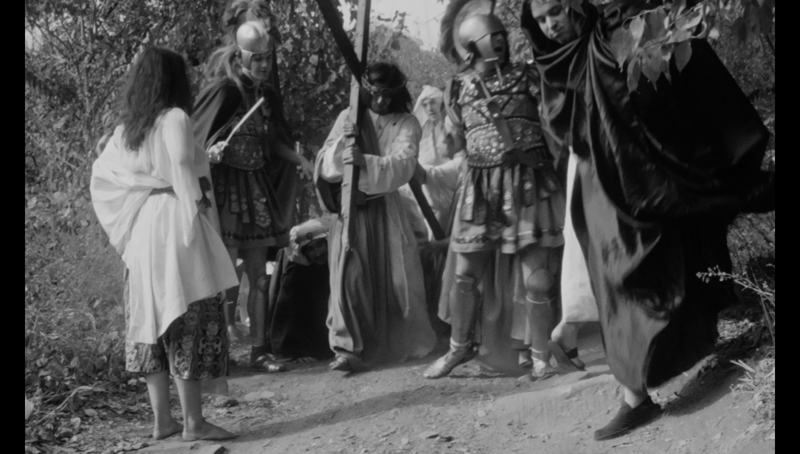 Shot in harsh black and white on next to no budget by Waters and his merry band of misfits, the film exists mainly to push boundaries. Devine (Devine) is the ringleader of a group of miscreants who lure strait-laced suburbanites into their carnival of depravity (featuring acts like a bicycle-seat licker, a puke eater, and "two actual queers kissing like lovers on the mouth") in order to rob, drug and murder them. The crew, which includes barker Mr. David (David Lochary), Devine's lazy daughter Cookie (Cookie Mueller) and a few other hot messes, are about as far from heroes as you can get, and with such an aggressively awful group, it's not long before they turn on each other, which sets up a tale of dishonesty and double-crossing carnality, leading to a finale of pure madness. the likes of which Waters pioneered. But, let's ignore the story for a moment, because that's certainly the least memorable part of the film. Actually, it would be hard to name the most memorable part, because the film is chock-full of them. Waters didn't let things like plot or reason get in his way when it came to creating indelible and indefensible scenes, so you get a handful of moments that seem to exist mainly because they could (and more likely would) offend a swath of people who heard about them (and were unlikely to actually see them.) Whether it's an over-the-top, blasphemous sexual encounter in a church (blended surreally with an in-depth depiction of the Stations of the Cross), a monstrous sexual assault or an insane finale that blends A Hard Day's Night with Godzilla, you will not forget this film. Each scene induces a sort of a cinematic PTSD, searing its memory onto your brain. That's not to say there's not good to be found in Waters' early madness. There's no arguing that Divine isn't fully devoted to his role, serving up a diva-worthy performance that makes it easy to understand why his criminal cult would follow him, while Lochary is a great analog for Waters, and the director's troupe is enjoyable playing against type as the straights.. There's an artistry to the way Waters contrasts the sacred and the profane at several points, not to mention his ability to cultivate a fascinating cast of characters who are interesting without saying much of anything. Plus, the music, recreated by composer George S. Clinton, is a perfect fit for the time and the tone, with a catchy collection of twangy guitar rock. But there are a few embarrassing performances sprinkled throughout (complete with flubbed lines) and the production falls several rungs short of polished, serving as an origin story for the filmmaker who would one day bring us classics like Polyester and Serial Mom. For all the issues that are rooted in the film being the product of an inexperienced group of outsiders, the big problem here is the presence of bits that were included solely for shock value (an unfortunately large portion of the movie.) For instance, there's a scene which shows a man actually injecting heroin. It adds zero to the film's plot, is completely disconnected to what happens before and after it and is pretty boring for something that offers nothing more than a taboo subject. 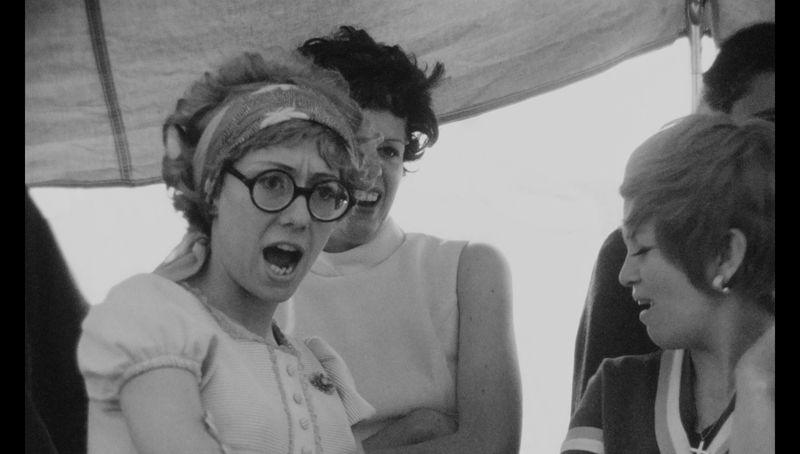 It's not the film's fault that it's impossible to watch Multiple Maniacs with the same mindset of the audience that saw it when it was first released, but the reality is changing times aren't kind to material desperate to offend and shake up the norms. Multiple Maniacs (spine number 863) arrives on one Blu-ray disc in a clear keepcase with an insert and a double-sided cover featuring a striking cover. The timeless Criterion menu fits perfectly with a clip of the film and some of the great music, and provides the choice to watch the film, navigate the timeline, select scenes and check out the special features. There are no audio options nor subtitles. As Criterion's in-depth explanation points out, this film was stored in Waters' attic under less than ideal conditions, but somehow, through the restoration process, it's come out looking rather great in an AVC-encoded, 1080p, 1.66:1 (column-boxed) transfer. Now, considering the low-budget shooting conditions and the skill of the filmmakers, this black and white movie was never going to look pristine, but Criterion has worked what has to be considered something just short of a miracle to achieve such a clean, well-defined image, with some solid contrast and a good amount of detail. There are focus and lighting issues inherent in the production, but nothing problematic has been introduced in the move to Blu-ray. You can compare the film to some of the clips in the extras to see just how bad this film could have looked without Criterion's TLC. Similar to the image, the sound wasn't exactly top-notch to begin with, but the LPCM 1.0 track ensures that the voices are as understandable as the original recording would allow. The real star on the sound side is Clinton's fantastic interpretation of the score, which is strong, yet appropriate. No complaints here, mainly because there wasn't a lot to work with in this arena. Though the film disappoints from several angles, the extras don't, simply because we get yet another delightful commentary from Waters. A raconteur beyond compare, he takes you down memory lane in a track recorded on the 2016 day the film was rereleased by Janus. There's a lot of reminiscing (particularly when it comes to the many cast members no longer with us), lots of production trivia and lots of info on his adventures in low-budget filmmaking. Hearing about his influences, both in terms of the film and his work in general, is just equation you'll be looking for, plus Waters provided a recommendation for a title he'd like to see in the Criterion Collection. Though I said the extras make up for the film, it is an admittedly small group of bonus content, with Waters' commentary joined by a 32:26 collection of interviews, a 10:40 video essay and Janus' trailer for their restored re-release of the film. What it lacks in quantity, it makes up for in quality, mainly on the back of the interviews, recorded in Baltimore in 2016 with Pat Moran, Vincent Peranio, Mink Stole, Susan Lowe and George Figgs. As you would expect of Waters' contemporaries, they have great personalities and great stories, sharing their perspectives on the production, how they meet Waters and what he's like as a director. Waters' fans should enjoy these clips greatly. The video essay, "Stations of Filth", presented by film scholar Gary Needham (in his heavy Scottish accent), takes an academic angle on the film, placing the film in the context of its times, exploring Waters' style and tendencies and even attempts to explains a perplexing crustacean appearance. Besides the re-release trailer, the disc wraps with a 12-panel fold-out, holding details on the film and disc, as well as an essay by critic Linda Yablonsky. It's too bad that we couldn't get one or more of Waters' early shorts here, to round out this look at his filmmaking beginnings. A questionable choice to be enshrined in the Collection, Multiple Maniacs feels like it would have been better as a pack-in supplement to one of John Waters' better films, though there are charming parts (particularly the hand-made aesthetic, seen in elements like the opening titles.) That said, the restoration effort from Criterion has made the film look better than it likely ever has, and the small but enjoyable selection of extras are the real reason why Waters' fans will want to check this disc out.